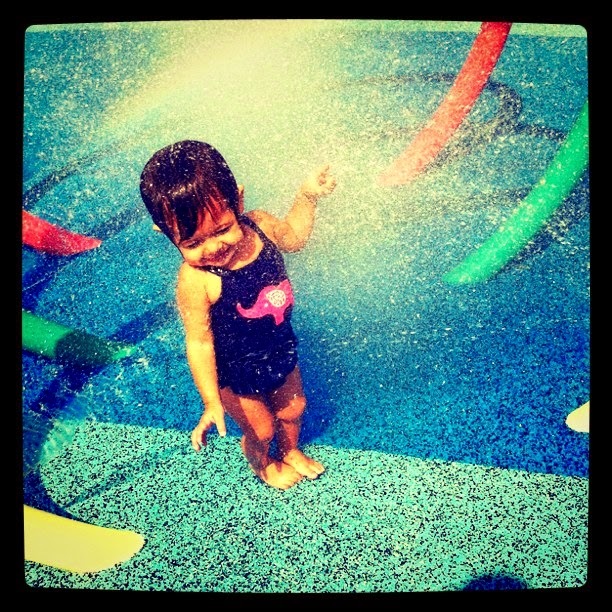 The unofficial start of summer for our family begins when the local splash parks start spraying. It started a couple of years back (2011) when we happened to drive by a park and said "oh, that place looks cool." The Wifey went home and did her research and came up with a list of all the splash parks (or also known as spray parks or splash pads) and the goal was to visit a new location every week. We only visited two that summer; weather and distance ended up limiting our options. Our favorite one is Ridgewood Park in Dallas near Mockingbird (off of Fisher Road). It's the least crowded and in the best shape. We didn't get to visit it last year because it was under complete renovation and opted for the Lake Highlands North location. 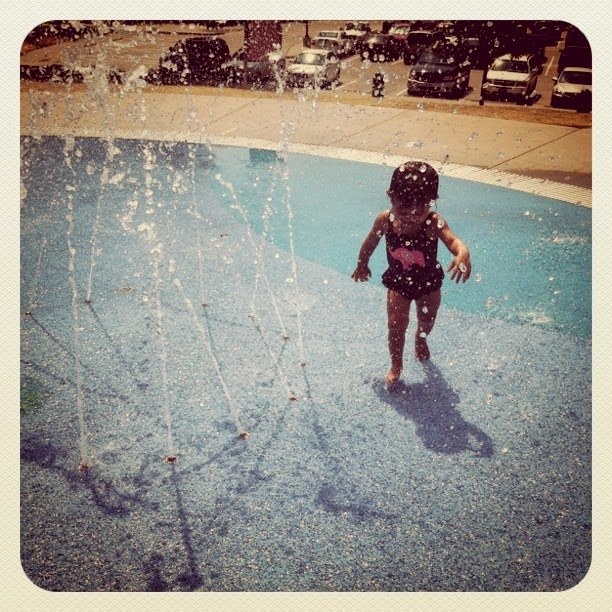 Not our favorite; it gets crowded and the splash pad is not in very good shape. This year the forecast was dry and it seemed like a great opportunity. We have a tradition of going to get breakfast tacos from Good 2 Go Taco, and then to the park. It's fun for the Wifey and myself watch her go crazy and spend time at every water station. So on Saturday morning me and the Wifey were up to get everything ready. Actually, the Wifey had been up since 3AM; she can't sleep ever since I knocked her up. I usually wake up to the gentle glow of Candy Crush from her iPhone screen. But that morning the Baby refused to get up. She has always been a late riser and could sleep until noon if we let her. But that morning was different. The mere mention of the work 'park' gets her up and out the door. But I had to carry her, still asleep, and put her in the car seat. She slept the entire time during breakfast. We had an inkling something was up but figured she was just tired since she didn't nap the night before and stayed up way too late. We went to the freshly renovated Ridgewood location - the spray park was unchanged but a new playground was added. We figured if that doesn't wake her up then something is definitely up. Sure enough, her mood didn't change. She refused the water and the slides. As I carried her back to the car, her head on my shoulder, I could feel her stomach begin to tense up and then memories of the Baby spitting up appeared on my shoulder. Except it wasn't milk spit up but straight vomit. Luckily she hadn't eaten anything and it was just straight stomach acid and water. But the damage was done. The white trash guy in me had to drive home without a shirt. So we went home, got some pedialyte pops and let her sleep it out. The Baby is normally a momma's girl and usually clings on her. But when she's sick, she prefers me. I don't know, maybe it's because I give off more heat and I am a great cuddler. But she will usually just lie down next to me and sleep. So after 4 hours of straight sleeping, she woke up, perfectly normal. And the first thing she asked when she started to feel better, "can we go to the water park? I didn't get to play this morning."